In the final analysis, Saddam's regime and its threat could not be defeated except by fighting it. Yet, in the history of war, the two U.S. divisions that carried the brunt of the fighting, the 3d Infantry Division and the 1st Marine Division are not impressive in numbers. History has seen much larger forces. But on the shoulders was placed the burden of liberating the Iraqi people, and planting the seeds of freedom in the Middle East. In the chaos, confusion, and uncertainty of an ever-shifting and always dangerous battlefield, the young men and women who faced this enemy distinguished themselves for their presence of mind, their steadfast commitment to each other, and their willingness to pay the price for our freedom and the freedom of the Iraqi people, a people they barely knew. The events chronicled here capture the story of the Marines of the "Blue Diamond" as they prepared for war, conquered and army, and liberated a nation. From across America and beyond, they chose the demanding path, to become Marines. These Marines marched in the ranks of this national treasure that we call the 1st Marine Division. And, at a time when timid souls or cynical pundits grew loudest, these men shouldered their weapons and moved without hesitation against the enemy. Our victory was not inevitable. It was the courage, unselfishness, and skill of the young men of Blue Diamond to whom we owe our victory. Unit histories such as this cannot capture what we will remember of those men we lost. The young smiling faces of these men will carry more inside us than our words can ever convey. For young as they were, they proved themselves to be the very best of warriors. We record history so that others may share our story. We record history so that others may learn from it. We record history to remind us of what happened on these battlefields when we grow old. Most of all, we record history as a monument to our men and their families' sacrifice. We will always remember those we lost. Someday we will smile and laugh when we recall them amongst us, of how we were happy besides them, or even exasperated with them, but how we trusted them always with our dreams and with our very lives. And as we look today at the men and women of the 1st Marine Division, we can take heart at what we see. The courage to defend our country is still there. That awesome determination to defend our freedoms will never die. In Iraq, those who followed in the footprints of the heroes of Guadalcanal, Inchon, Hue City, and Desert Storm proved themselves worthy to be counted among their number. 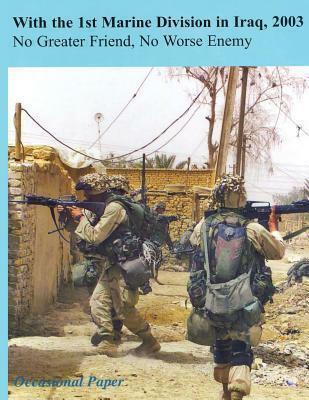 No mere narrative can fully capture the efforts, risks, and sacrifices of the men and women of the 1st Marine Division during Operation Iraqi Freedom. No words can capture the tears of family members as they sent their loved-ones off, perhaps for the last time. Nothing we can say will bring back our beloved comrades that made the ultimate sacrifice on the battlefield. Yet, "unsung the noblest deeds die." This is the story of the noble deeds of a special group of Marines who chose to serve their nation in the cause of freedom in a distant place.